Turn your Pi into a Lilliputian ghetto blaster with Speaker pHAT! Speaker pHAT crams an I2S DAC and mono amplifier, a tiny 8Ω 2W speaker, and a 10 LED bar graph all onto one teeny little pHAT. 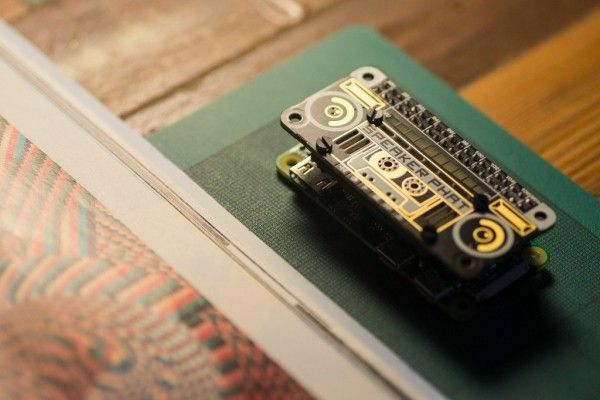 It's the neatest way to add audio to you Pi project, and its beautiful artwork evokes an 80s boombox! It can't claim audiophile sound quality, but it's perfect for fun little projects where you want to add sound output - speech, notification sounds, or light music, for example. 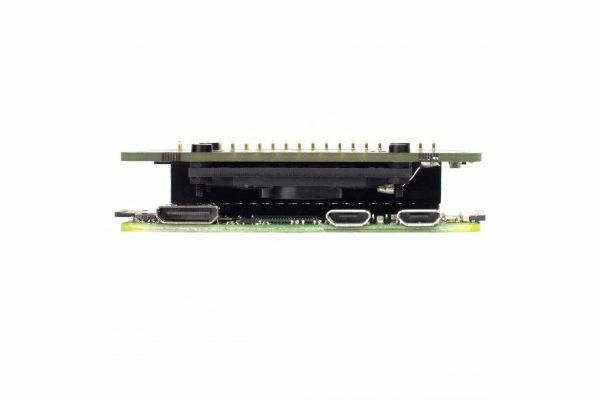 Why not combine it with a little USB microphone to make a tiny voice-activated assistant in the style of Amazon's Echo? Or set up a simple Flask API and send audio notifications to it from IFTTT with a simple HTTP request. 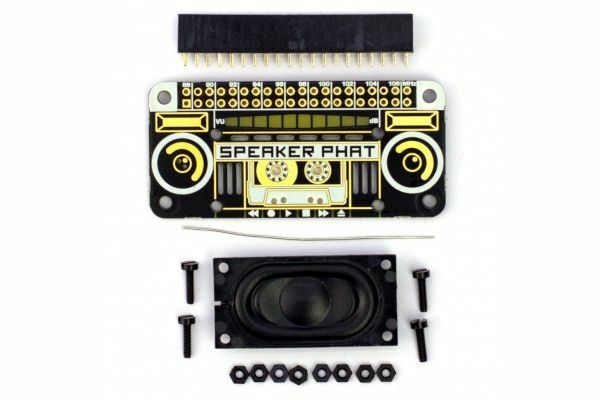 It comes as a kit, so you'll have to solder on the female 40 pin header, and screw and solder the speaker on. Check out Pimoroni assembly guide for more details. 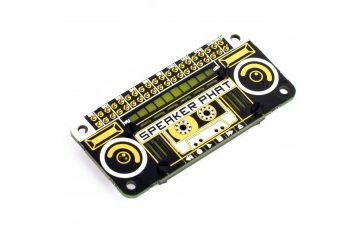 The MagPi said that Speaker pHAT was "a great way of adding audio to projects" and that "it looks cute too", giving it four stars. Pimoroni had put together a handy one-line installer that will get everything set up in a jiffy! 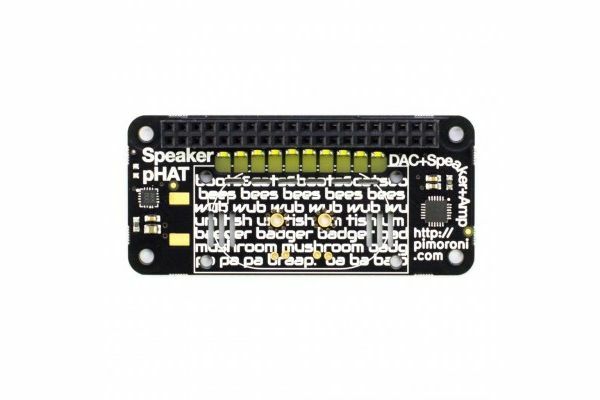 Our installer configures ALSA to output sound through the DAC on Speaker pHAT, and installs a custom plugin to display sound level on the bar graph LEDs. Find details of how to run the one-line installer in the Speaker pHAT GitHub repo. - The dimensions of an assembled Speaker pHAT are (height does not include the female header): H 10mm x L 65mm x B 30mm. The speaker itself measures: H 6mm x L 40mm x 20mm. 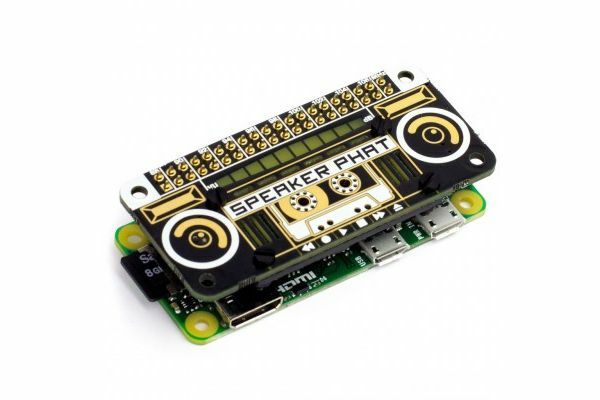 - Speaker pHAT won't fit on top of a Pibow Coupé or Pibow Zero due to the height of the speaker, and you won't be able to use a heat sink for the same reason. - It's important that you use four of the included eight nuts as spacers to space the speaker slightly away from the PCB. Not doing this, and having the speaker cone touching the PCB, can result in sound degradation and even damage to the speaker.